John Darnielle can’t pinpoint exactly when he realized that none of the songs on the Mountain Goats’ new album, Goths, included guitar, but the singer remembers how he felt. “It was a very liberating thought to me,” he says. One reason for that is the Mountain Goats’ enduring, if long outdated, reputation as a purveyor of “driving lo-fi guitar tunes,” as Darnielle puts it, quoting from an imaginary boilerplate review of the kind that continues to follow the band. That description was accurate 15-plus years ago when he was recording entire albums at home by himself on a boom box, but a lot has changed. 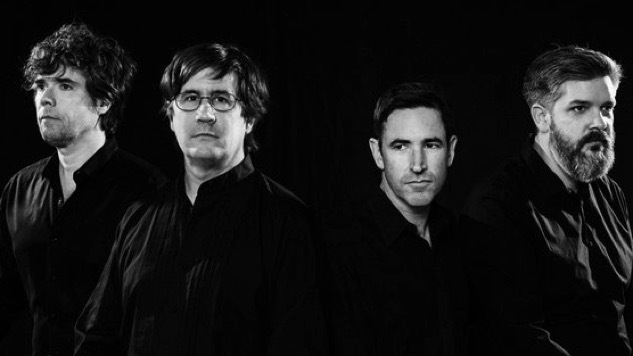 Mountain Goats albums have grown almost lush since 2002’s Tallahassee, the first LP Darnielle made in a recording studio, backed by an actual band. Subsequent releases have often featured as much piano as guitar, with ornamentation from strings and horns. With 12 new songs written almost entirely on keyboards, Goths is full of lithe arrangements and luxuriant musical touches: a choir on “Rain in Soho,” woodwinds on “The Grey King and the Silver Flame Attunement” and the late-night gleam of a Fender Rhodes electric piano on several songs, including “Shelved” (which also features bassist Peter Hughes’ first lead vocal). With Darnielle’s distinctive voice and his wry humor, there’s no mistaking Goths for anything but a Mountain Goats album. At the same time, it’s the band’s biggest step yet away from the forceful, propulsive acoustic guitar strumming that helped define the Mountain Goats in the early years. Darnielle calls that sound his “default rhythm,” and he used to employ it frequently, on songs including “Up the Wolves,” “The Best Ever Death Metal Band in Denton” (which you can listen to in the player below), “Going to Georgia” and plenty more, until drummer Jon Wurster told him there were only so many ways to accompany it. That same concept prompted him to seek out contributions from pros in Nashville, where the Mountain Goats recorded Goths at Blackbird Studio. Darnielle recruited 16 members of the Nashville Symphony Chorus to sing a portentous vocal part on album opener “Rain in Soho,” an appropriately goth-y track with deep bass notes on piano. To help arrange rich layers of backing vocals on “We Do It Different on the West Coast” and “Wear Black,” the group hired singer Robert Bailey, who has been part of Garth Brooks’ touring band since 1991, worked with Wynonna Judd and sang on the televangelists Jim and Tammy Faye Bakker’s PTL Club show in the late 1970s and early ’80s. Fair enough, but did he hear any fun behind-the-scenes stories from life on the road with Brooks or Judd, or what the Bakkers were really like? Like other recent Mountain Goats albums, Goths has a theme. Songs on The Life of the World to Come in 2009 took their names from Bible verses, for example, while All Eternals Deck in 2011 was based on a fictional set of tarot cards. Beat the Champ featured songs inspired by professional wrestling, though it wouldn’t be the Mountain Goats without subtext. “There was a lot about cutting losses and living performatively, and the vehicle through which those are being understood is wrestling,” Darnielle says.